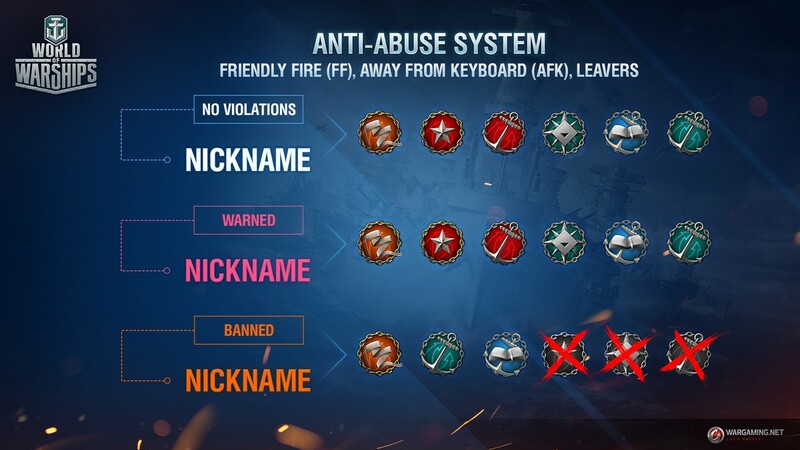 Update 0.7.4. takes the system for preventing misconduct in battle to a new level! 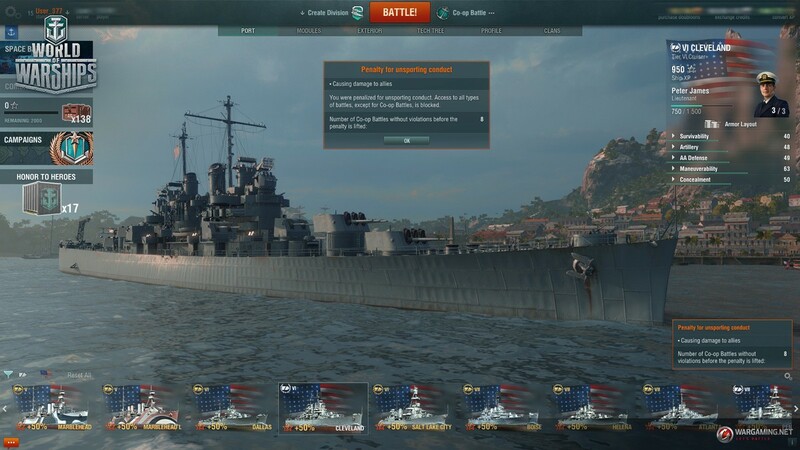 It will affect both inactive players and those who deliberately attack their allied ships. The new system will more closely track the players whose behaviour does not comply with the current rules and adversely affects the game of the entire team. The new system is more nuanced and enables us to determine the degree of a player's guilt more accurately, adjusting the penalties accordingly. As before, the status of players directly depends on their actions in battle and is shown by the colour of the nickname. When a user violates the rules, is "AFK" in battle, or attacks allies, the system first simply prompts such players to think about their behaviour and start playing fairly, while the player's nickname turns pink. The warning itself contains information about what the player was punished for. If, after the first warning, the player continues to violate the rules of fair play, the next step of the system will be to prohibit access to all types of battles, except for Co-op Battles, Clan Battles, and Training Room, while the player's nickname will turn orange—but only in the Port. To return to battles against other players and gain access to other types of battles, the player will have to take part in several Co-op Battles against bots. The player must still observe the rules of the game and contribute to the battle. Please note that in battle, the offender's nickname can only be pink, regardless of the severity of the punishment. Access to Clan Battles is not prohibited even with the offender status. Punishment for misconduct in this battle mode will be given by the clan leader. For example, a leader can dismiss a player from participating in Clan Battles, but cannot directly affect the player's status in the system. If the users demonstrate unsporting conduct in Clan Battles, they can get rid of the offender status in Co-op Battles only. The conditions for determining unsporting conduct do not change, so we remind you of the main criteria for each of the violations. For cruisers, destroyers, and battleships, the system takes into account such "activity indicators" as the minimum distance covered, participation in the capturing and defending of key areas, and damage caused to enemy ships with the main battery, torpedoes, or by ramming. In this case, the minimum distance covered is calculated in such a way that if a fixed ship is "pushed", it is not considered active. If you don't want the system to consider you an offender, you must fulfil at least one of the conditions. Aircraft carriers are considered to be inactive if none of the following conditions are met: destruction of enemy aircraft, damage to enemy ships and aviation by any means (AA guns, secondary battery, ramming) and loss of own aircraft. Damage is measured as a percentage of the total HP pool of an allied ship. If damage is caused to multiple allies, the percentage values will sum up. Hitting allies with torpedoes will be taken into account, only if you launched your torpedoes at a distance of up to 5 kilometres. Like in the case of destroying an allied ship, damage caused to your teammates can lead to restrictions on access to some types of battles. Also, do not forget about the mirror damage caused to the offenders' ships after their nicknames turn pink, and about penalties to their credits and experience depending on their battle results. We remind you that "mirror damage" is the damage caused to your ship in response to your damaging of allied ships. No active play for more than 75% of the duration of a battle will be treated as fleeing the battlefield/quitting the battle early (both at your own discretion and in the case of technical failure). Example: a player participates in battle for 7.5 minutes, saves the ship, and leaves the battle before it ends. If the duration of the battle is more than 10 minutes, the player will receive a corresponding warning or even punishment, if there are other violations on the account. We understand that no one is immune from sudden disconnection from the server or unforeseen life situations. If the player is not a regular violator, the chance of getting banned from some types of battles is rather low. A player destroys a friendly ship in battle, this player's nickname turns pink. Access to different types of battles is not restricted. After two battles without violations, the player's nickname returns to white, but the system will still attribute the player to the risk group. After a couple of battles, the player destroys an allied ship. Since this is a "repeated violation", the warning is stricter than it was the first time. Now the player's nickname will stay pink for a few battles more. Access to different types of battles is not restricted. A player clicks "Battle!" and gets distracted by a video from the web or answers a call, forgetting that his Yamato has left his allies without the necessary fire support. The player gets a warning and his nickname turns pink. The next battle has no restrictions on the choice of the battle type, and after the battle, the nickname returns to its standard colour. One battle later, the player destroys an allied ship and flees the battlefield. The nickname turns pink. In the next battle, the player is inactive! For the repeated violation of the rules of the game, the player receives punishment: the nickname changes its colour to orange, and the system banishes the player from some types of battles. To remove the restrictions, the player has to play a number of Co-op Battles without violations. The player is shown the number of battles needed before returning to the "normal" white status. After serving the punishment, the player's nickname will stay pink for a few more battles. Players can get rid of the pink colour if they play by the rules in all types of battles, except for Clan Battles. In case of more violations in the future, the punishment will be stricter, because they are repeat violations. The player destroys an allied ship and gets a pink nickname. After a couple of battles, the nickname returns to the normal colour, but the player continues with unsporting conduct: they destroy an allied ship and leave the battlefield before sinking. The system banishes the player from all types of battles, except for Co-op Battles and Clan Battles, and recolours their nickname orange. The player enters a Co-op Battle and continues to be inactive, thereby aggravating the punishment. Now the player needs to play a few dozen "clean" battles against bots. As you can see from the above examples, the system is more loyal to those who made a mistake or left the "control post" due to an unforeseen situation. Yet, it effectively punishes conscious and multiple offenders. To prevent possible manipulations with the system, we will not disclose the specific numbers that affect a player's rating. 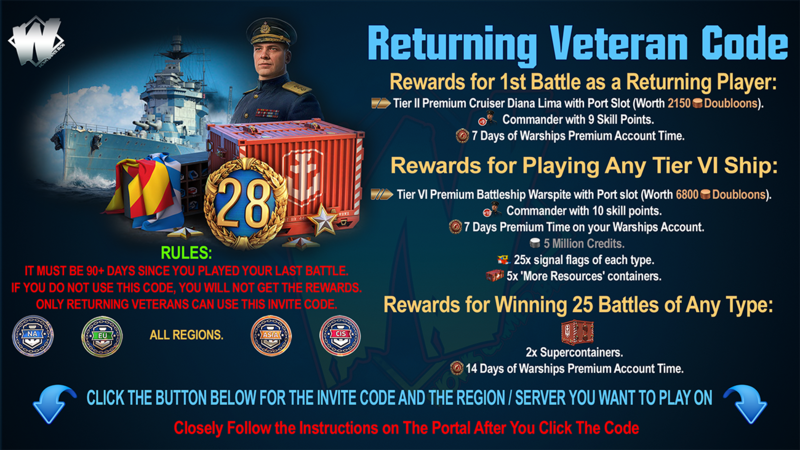 Obviously, the severity of punishment corresponds to the gravity of the offence, and battles in World of Warships will be more comfortable for all participants who strive for victory. 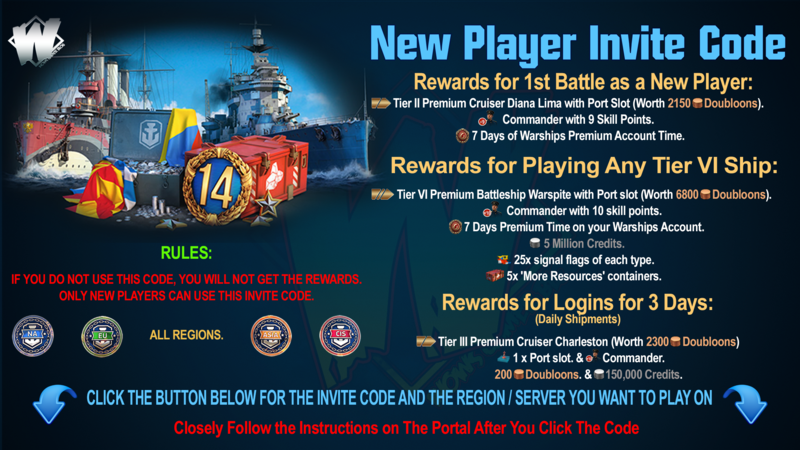 Finally, we urge all commanders to respect other battle participants and their time. See you in battle!